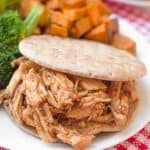 This easy crockpot pulled BBQ chicken takes about 5 minutes to prep, and then your dinner work is done! Serve with roasted sweet potatoes or your favorite Southern sides. As I’m typing this, the snow is coming DOWN outside. For those of you who aren’t from the South, everything shuts down when it snows, which means there’s no class today..and probably tomorrow…and maybe the next day. One of my best memories from my freshman year at UNC was sledding down a big hill near our dorms on mattresses at 2 am when it started snowing. People were using laundry baskets, open pizza boxes…anything they could find! I’m excited for a cozy snow day with some good food and some tea…and maybe a couple of snow adventures later. And I have the perfect slow-cooker recipe for you, whether you’re having a snow day or not! 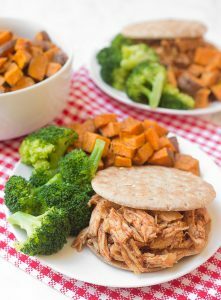 All you do for this crockpot pulled BBQ chicken is place chicken breasts + broth in your slow-cooker. A few hours later, you shred the chicken, discard the broth, and add BBQ sauce, and you have a delicious meal all ready to go! Since BBQ always needs sides, I served mine with roasted sweet potatoes and steamed broccoli. You could also serve mac ‘n’ cheese, baked beans, coleslaw, potato salad, or any of your other favorite sides. A note on store-bought BBQ sauces: they tend to be REALLY high in sugar. 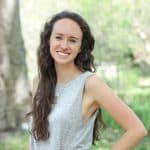 For example, 1/4 cup of Trader Joe’s Organic Sriacha BBQ sauce has 24 grams of sugar in 1/4 cup of sauce, which is as much sugar as a serving of Ben & Jerry’s. Since I try to eat sugar in moderation and save it mostly for things like my after-dinner ice cream, I just check the labels and specifically look for a sauce low in added sugar. Annie’s Naturals makes some organic BBQ sauces with less than 8 grams of sugar per 1/4 cup serving. If you have time, you could also always make your own sauce. If you try out this crockpot pulled BBQ chicken, feel free to let me know in a comment or take a picture and tag me @livbane on Instagram. Hope you enjoy! Rinse and if necessary, trim chicken breasts. Pound or slice chicken breasts so each piece is roughly the same thickness/size as the other pieces. Add chicken broth and then chicken, adding more broth (or water) to fully cover chicken, if needed. Cook on HIGH for 3 - 3 1/2 hours, depending on your slow-cooker's settings. Remove chicken breasts onto a cutting board or plate, and let rest for a few minutes. Discard cooking liquid. Turn slow-cooker down to the WARM setting (or LOW if you don't have a WARM setting). Check to make sure that chicken is white inside and cooked through, then shred with two forks. Return to slow-cooker and add BBQ sauce. Serve on buns and/or alongside roasted sweet potatoes, roasted or steamed broccoli or cauliflower, or your favorite Southern sides like mac 'n' cheese, coleslaw, and potato salad. Store leftover BBQ chicken in the refrigerator and enjoy within 2 days for the sake of freshness. As I read this I can’t figure out why I hadn’t thought of it! Great way to meal prep for he week! Yes!! Hope you love it, Sarah! I am here in Athens, GA and things were shut down today – and looks like tomorrow as well – and we barely got an inch! This would be wonderfully rib sticking to enjoy in this nasty cold weather! Hope you stay warm! That’s typically how it is here…although we got 8+ inches in NC yesterday! I don’t think that’s happened in the 7 years I’ve lived here. Hope you’re staying warm and cozy! So easy and fast to prep for a tasty meal! Great BBQ side dish ideas too; love the idea of serving it with sweet potatoes and broccoli. Thanks, Marie! Sweet potatoes + broccoli are two of my go-tos! Such an easy recipe ! I’ll make a large batch which will be perfect for the weekend ! So simple! Jesse would loveeeeee this! Hope you get a chance to make it!! So simple I will try it. Have fun I’m the snow. Hey Liv, nice and simple recipe. I am sure it will be tasty. Just wanted to say that it is not recommended to rinse chicken or any poultry since the risk of cross contamination across is so great when this is done. Thanks for sharing the simple recipe! I going to try it tommorrow. 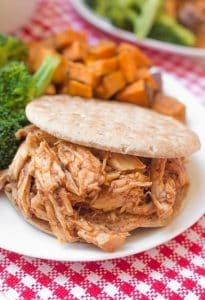 This really easy crockpot pulled BBQ chicken. 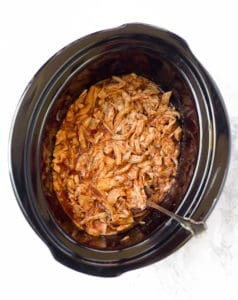 Thanks for sharing the 3-Ingredient Crockpot Pulled BBQ Chicken recipe!